The Planetary Radar Operation Center (PROC) system is a Spatial Data Infrastructure with automatic catalogue and archive features for standard scientific products. PROC is an Italian Space Agency program unifying the Operative Centers of ASI, ESA and NASA joint planetary missions, in order to set up a unique point of access to the data produced. 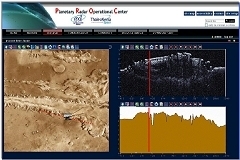 The Planetary Radar Operation Center (PROC) is an ASI (Italian Space Agency) program aimed at unifying the different Operative Centers of ASI, ESA and NASA joint planetary missions, in order to set up a unique point of access to the data produced. The actual centres SHOC (Sharad), MOC (Marsis) and C-PAD (Cassini) collect, respectively, data from the MRO (Mars Reconnaissance Orbiter), Mars Express e Cassini-Huygens (on Titan a Saturn moon) missions. By the PROC web portal, missions data become accessible both to an unspecialised public and to the scientific community. Moreover by the SpaceGIS web application, developed inside the PROC program is definitively possible to navigate on-line both cartographic planetary data (Mars, Titan and even other planets like the Earth) and subsurface radargram data. The PROC system is structured like an SDI (Spatial Data Infrastructure) which allows to catalogue and archive automatically standard scientific products (in PDS format) and allows to deliver them on Internet, via OGC standards, after a conversion in JPEG2000 format. The technologies used are the best of FOSS (Plone, PostGIS and GeoServer) and commercial ones (ERDAS Image Web Server). The PROC project has seen the cooperation of Università di Roma Tor Vergata and IFSI/INAF, responsible for the scientific activities, with Thales Alenia Space Italia (TAS-I), prime contractor and responsible for the industrial activities.